During the holidays, there are a lot of parties for family, neighborhoods, work, and more. At many of these functions, there is alcohol being served, which leads to some dangerous situations. The day before Thanksgiving kicks off the season of drunk drivers. It is even called “Black Wednesday” because it is such a popular drinking holiday. Bars are often busy with college students just out from school for the break and as people get ready to spend the next day with family. From Black Wednesday to New Year’s Day, with spikes on Thanksgiving, Christmas Eve, and New Year’s Eve, account for the days with the most extreme alcohol consumption. 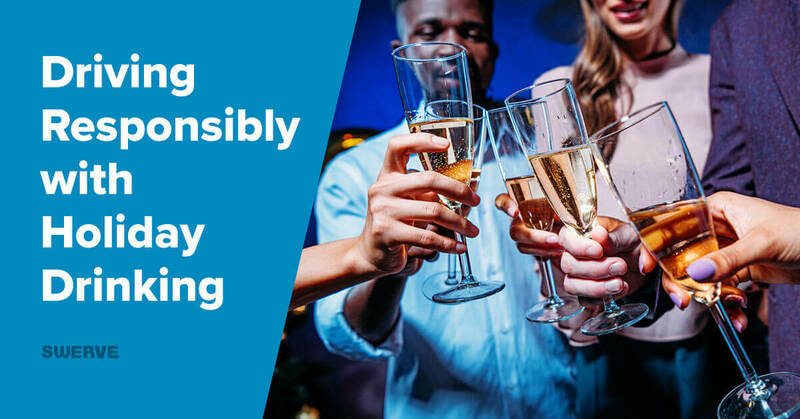 No matter what day you are out celebrating, here are some tips for driving responsibly with holiday drinking. If you know that you are going to be drinking at a party, have a ride arranged before you go. Family and friends can all switch off being the designated driver so that everyone gets to enjoy drinking at some point. Another option is to arrange to have a friend pick you up and bring you home if they are in the area. If you don’t have someone to be your designated driver and still want to drink, be prepared to get a ride home by calling a ride share service or cab. A lot of parties have punch bowls full of pre-mixed drinks. Some are alcoholic, some are not. If you plan to drive yourself home, don’t make assumptions about what you’re drinking. Always ask the party host what is in the drink before you grab a glass and ask for something non-alcoholic if you’re driving. If you know that you are going to a party to drink, remember to drink responsibly. Decide how much you are going to drink beforehand, sip your drink, and make sure you eat food with your beverage. A good rule of thumb is one drink per hour while eating food to help metabolize the alcohol best. The purpose of holiday parties isn’t just to get drunk or a way to cope with family drama. Having too much alcohol can impair more than your ability to drive, but also your judgement. Drinking responsibly can help you stick to the safety plan you made before going to the party. While it isn’t required that you make sure no one drinks and then drives a car, it is great to have someone watching out. Offer to give a friend, coworker, or family member a ride home if you notice that they have been drinking. If giving a ride is inappropriate or they refuse the offer, help arrange a different way for them to get home. As the old tagline says, “friends don’t let friends drive drunk” and you could save a life by keeping them from behind the wheel of a car. Just because you choose to drive responsibly during the holidays doesn’t mean that you won’t have any fun. Take time to celebrate and enjoy the season but do it while being smart. Don’t ever drive if you have been drinking and do what you can to encourage others to be responsible too. More drivers are out on the road during the holiday season. Whether it’s driving to a holiday party, family function, or going out shopping, there are many reasons why the roads are more congested. 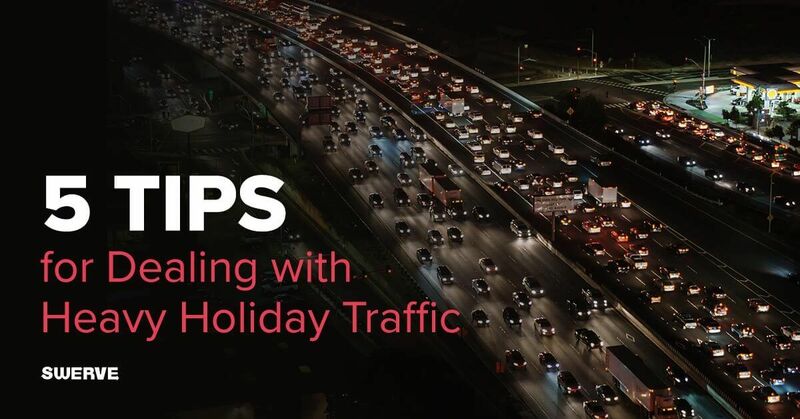 If you are out in the holiday traffic for any reason, here are five tips you can use to deal with the traffic and keep yourself safe. Timing is everything for road trips. Whether you are driving over the river and through the woods or to an entirely different state, always give yourself some extra time to travel. Since everyone is out on the roads heading to their holiday parties, there will be heavier traffic than normal. Depending on where you are, the weather might also slow you down. If you give yourself plenty of extra time for traveling, you will feel less stressed and hurried while you’re driving. This helps keep frustrated feelings at bay, limiting risky driving maneuvers and yelling at other drivers. One tip for planning ahead is to try and plan to be in the biggest cities or the areas of construction during a time that isn’t quite so busy. One way to deal with holiday traffic is to bring things along in the car for entertaining. For kids, bring movies, games, snacks, and anything else to keep them busy and distracted during a long car drive. The driver should always stay focused on the road and avoid using cell phones or looking away from the road. Just plan to have something to help you pass the time if you hit traffic that you know can help keep you calm and happy in the car. Heavy traffic is stressful and causes some drivers to throw common courtesy out the window. During a time when things are supposed to be merry and bright, it’s important to still be considerate and follow the driving laws. Use your signals when you are switching lanes or turning, give the driver in front of you space, and drive slowly. Don’t forget the basics of driving just because you are in a hurry or there are more cars on the road. To boil down this point to a catchphrase, “expect the unexpected” is a good thing to remember. While you can’t control what other drivers are doing on the road around you, it is possible to attempt to anticipate their movements. If you see a driver up ahead constantly looking over their left shoulder, you know that they probably want to switch lanes. If you are watching and trying to anticipate other driver’s movements, especially in heavy traffic, you can keep yourself safe if they make a mistake. Sitting in traffic for long stretches of time is exhausting to you physically and mentally. Make sure you take breaks from sitting too long. Taking occasional stops are great for stretching out your legs, refreshing the mind, and searching for alternate routes. Be sure that you are not letting yourself get too tired behind the wheel. Tired driving is another form of impaired driving, so switch up drivers or pull off the road for a nap if you need it. While the holidays are a time for love, family, and celebrating, make sure that you get to all your destinations safely. With so many people on the road, it’s better to keep your guard up and your driving skills sharp, while still avoiding conflict and car crashes. Parallel parking is a required part of driver’s education. Since many students have heard it is difficult, they are scared to even try it. While it does take some skill to master this parking maneuver, it is possible to do it with some practice, patience, and confidence. If you remember the following five steps to parallel parking, you can not only do it the right way but also feel comfortable doing it. Too many drivers make parallel parking difficult for themselves by choosing a spot that isn’t big enough for their vehicle. Before you even try to pull into a spot, make sure it has enough space that you feel comfortable trying to park there. One great way to see if it’s big enough is to notice how big your car is as you are slowly passing the spot. Will you have enough space to straighten out your car in the spot? Is there space for the cars in front and behind you to get out without hitting your car? If you see that it will be a tight fit, keep driving. It might take some extra time to find another spot or walk to your destination, but it is worth avoiding the damage or holding up traffic. It’s important that you let the cars around you know that you intend to park in the open spot, so turn on your blinker toward the curb. Pull up next to the car you will park behind, lining up your back bumper to theirs. This helps you get in the right angle to pull your car in quickly and easily. Use your rearview mirrors and look over your right shoulder to get a clear view of the area as you back up. Slowly direct your car to the back-right corner of the parking spot. As you become lined up with the vehicle’s rear bumper in front of you, start to straighten out your vehicle while continuing to back up slowly. Once you are in the parking space, turn your wheel left to straighten it out. Double check that you won’t hit the bumper of the car in front of you as you finish pulling in. Adjust your vehicle so that you are centered between the two cars, making sure that once again, they both have the space they need to pull out of their parking spot without hitting your vehicle. Once these five simple steps are complete, you can safely exit your car and go on with your business. Learning which spots you can fit into and how to do the steps properly will take time. The good news is that the more you practice, the easier it will become. If it makes you more comfortable, practice with orange cones before trying to park between actual cars. 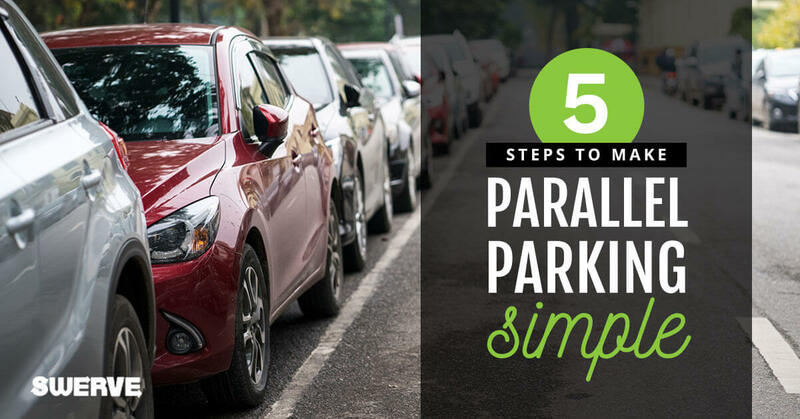 Stay calm while you park and before you know it, you will be parallel parking like a professional. Roads are full of large semi-trucks. Large trucks like these are used to transport merchandise and large deliveries for companies in almost every industry. Driving around them can be uncomfortable and for good reason. In the most recent report by the Federal Motor Carrier Safety Administration (FMCSA), 2016 was a rough year for truck drivers with 55,633 semis involved in crashes that involved injuries and 99,911 semi-trucks were involved in tow-away crashes. 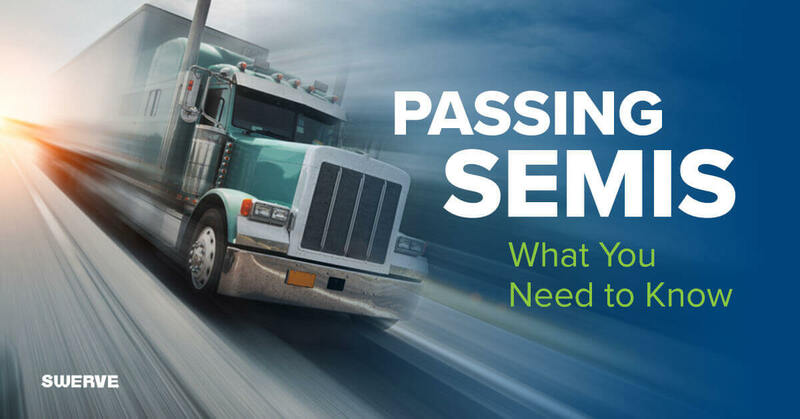 To make sure you are educated on how to pass semi-trucks on the road, here are some things you can remember. Semis have large blind spots because of the trailers they are pulling. They have large mirrors to help, but the size of their blind spots compared to a normal vehicle are much larger. They are on both sides of the truck, plus the front and back. When you are trying to pass a semi, make sure you stay out of these spots or pass through them quickly. If you linger too long, the driver probably doesn’t know you are there and might merge right into your car. A good rule of thumb is that if you can’t see the driver in their side mirrors, they can’t see you. Every multiple lane road is supposed to have slower traffic in the far-right lane with the lanes on the left all being passing lanes, with each increase in speed to pass the slower traffic on the right. This is the safest way to pass all traffic, but especially trucks. Semi-trucks have their largest blind spot to the right of their trucks, spanning multiple lanes. Since truck drivers are trained to pass on the left only, it makes the most sense that they aren’t expecting to be passed on the right. Another reason to not pass on the right is that semis must make wide right turns to clear their trailer around corners. When vehicles sit on their right side, they block a portion of the road and make it very difficult for the truck driver to maneuver. Don’t ever try to pass a truck at an intersection on the right side if they are signaling their intention to turn that direction. Once you have passed the semi, merge back into traffic carefully. Since there is a blind spot on the front of the truck, the driver is too high to see if you merge too closely. In fact, the second most common unsafe act that drivers do around a semi is merging improperly into traffic. This causes the truck driver to do a quick maneuver to avoid crashing or brake quickly, which is difficult in a truck weighing more than 10,000 pounds. Give them a lot more room between you than you would a regular vehicle on the road. Driving with semi-trucks on the road doesn’t have to be dangerous. Following these passing rules helps keep traffic flowing smoothly. Most truck drivers are doing the best they can to get their load where it needs to go. If you can give them enough space and be respectful, everyone can stay safe on the road. The evenings are getting darker, leaves changing colors, and temperatures are dropping. That can only mean one thing; fall is here. As October gets into full swing, preparations for Halloween are going strong. One thing to include in your Halloween prep is taking a refresher course in driving safety for the big night. While it might be all fun and games, it’s important that you know how to navigate the night safely. Halloween is a fun night for people of all ages, including children. Whenever you drive in an area when there will be extra pedestrians around, it is important to increase your cautiousness. Drive a little slower than necessary and try to anticipate people walking out in front of your car. Watch the people on the sidewalks with more vigilance. Kids are more likely to run into the street or step off the sidewalk when they are out walking with a group and excited. Not only will people be dressed in darker clothing and costumes, but children are also harder to spot since they are shorter. Driving slower means you will be able to stop your vehicle faster, avoiding pedestrians of any size. If possible, avoid areas that you know will have a high number of trick-or-treaters, including neighborhoods, businesses doing trunk-or-treat events, or even popular Halloween attractions like haunted houses. Also, be sure to keep your headlights on, even if it is barely dusk. It’s important that pedestrians can see you too. Another important way to drive with extra caution is to make sure you have a full range of vision and hearing. Don’t wear a mask or anything over your head while driving. If your costume prevents you from moving your arms or legs freely, just don’t wear it. You will need to have full use of your body to steer or brake quickly. 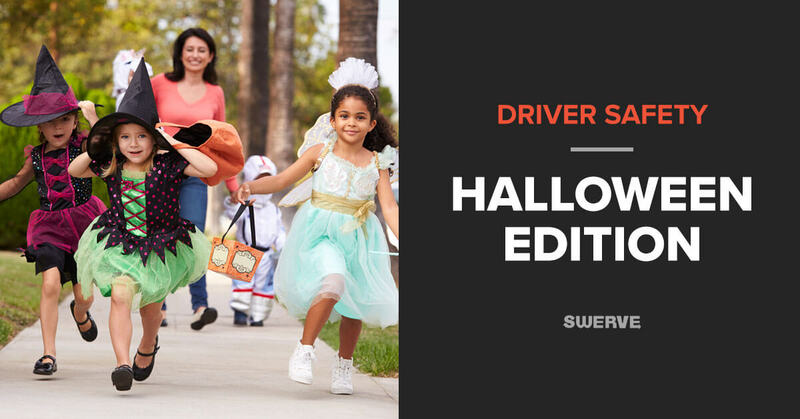 It’s more important to drive safely, so change into your costume when you get to your destination if it is going to interfere with your driving abilities. Limit all distractions when you are driving. Don’t play music too loudly, do anything on your cell phone, apply makeup, eat, or get too involved in conversations with your passengers. It is important to focus on driving safely and anticipating any accidents. If traffic slows down or a pedestrian walks in front of your car, staying focused can make all the difference in avoiding a crash. Another key to staying focused is to not drive impaired. If you are attending a party where there is alcohol and intend to drive home, stay away from the drinks. If you do plan to drink, have a designated driver for your group or arrange to find another way home. Alcohol slows your reaction time, limits your concentration, and decreases your coordination. These all interfere with your ability to stay focused on the road and driving safely. Halloween is an evening of parties and fun that go well into the night. Being responsible by driving cautiously and staying focused, you can keep all the scary stuff in the parties and activities, away from the road. Four-way stops, or intersections that require all four directions of traffic to come to a stop, are some of the first traffic rules discussed in driving school. They are often a frustrating experience for many drivers though because they don’t remember who should go first. 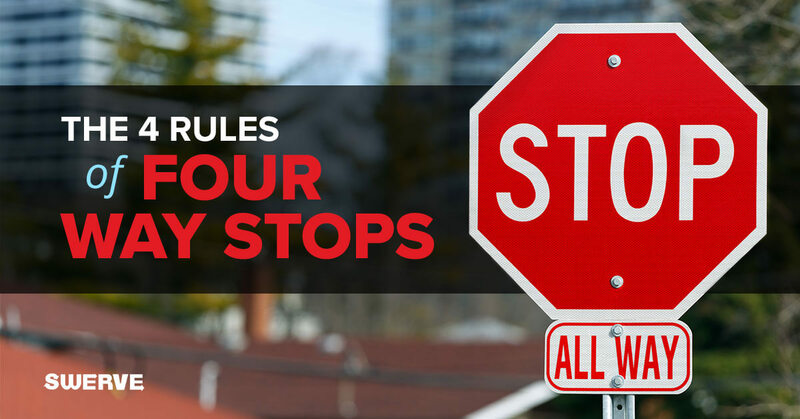 Having a good, solid understanding of the four rules of four-way stops is one of the best ways to prevent collisions, road rage, and frustrations when you approach one of these intersections. The first car to pull up to the stop sign is the first car that gets to proceed. If cars are all stopping at the intersection at different times, each should proceed through in the order they arrived. It doesn’t matter which direction a car is going either. Just like in kindergarten, you wait for your turn and don’t cut in line. Sometimes two cars stop at the intersection at the exact same time, or at least close to the same time. If it isn’t clear which car was there first, the law says the car on the right has the right-of-way. If another car has pulled up to the intersection, the cars that arrived at the same time both go through the intersection first. If two cars are across the intersection from each other at the same time, and no car is on the right of the other, it depends on the traveling direction of the two cars. If they are both going straight, they can go at the same time without any problems. If one vehicle is turning and one is going straight, the right-of-way goes to the car going straight. If two cars are directly across from each other and pull up to the four-way stop at the same time and one is turning right and one is turning left, the right-of-way goes to the vehicle turning right. Since they are both trying to turn into the same lane of traffic, it makes sense that the vehicle turning right would go first because they are the closest to the lane. The best way to stay safe at a four-way stop is to communicate. The laws that dictate right-of-way based on turning direction show that communicating through signals is vital. If there is any doubt on whose turn it is, wave people through or motion that it is their turn to let them know that you intend to wait for them to go before pulling into the intersection. Try not to get too uptight if people go out of turn. If an aggressive driver thinks it is their turn and pulls out into the intersection, yield to them, even if you know that you had the right-of-way. The rules were made to help keep the flow of traffic going while keeping everyone safe. Knowing when it’s your turn to drive through the intersection is very important, but don’t get so caught up in the way it should happen that you compromise safety. When it comes to teaching teenagers to drive, the most important factor is you, the parent. Showing your teenager how to drive starts long before they start driver’s education. Here are five areas you can focus on to set a great example for your future drivers. Before you get behind the wheel, pay attention to how you are feeling. Are you stressed? Angry? Distracted? If you answer yes to any of these feelings, you are not going to be able to drive calm and caring. Any of these can increase your chances of road rage, impatience in following laws, and your ability to effectively talk to your teen about things you see on the road. The same goes for impaired driving. If you have been drinking, doing drugs, taking medications, or are overly tired, you are not fit to drive. Make sure you say out loud to your child that it is important to never drive impaired. Before you pull out of your driveway, it is important to make sure you are wearing a seatbelt. If you have passengers in the car, it is vital to make sure they are all buckled in properly too. This shows others that safety is a priority in your car and you expect them to follow the rules. There will be plenty of times on the road that you will be cut-off or someone does something aggressive around you on the road. Instead of getting upset, show your child how to stay calm, focus on the road, and keep your composure. If someone does something incorrectly on the road, calmly point it out to your child and explain why it was not right. Showing examples and taking time to explain is the best way to teach a principle. A child only has as much respect for the law as they are taught. Make sure you follow the speed limits and other traffic laws. Most importantly, do not use your cell phone while driving. If you need to respond to a message or look something up, pull off the road. You can even hand your phone to them to do it for you. Don’t make exceptions for yourself. As the parent, it can be hard to receive correction from your child when you are the one who is supposed to be correcting them. When your child points out that you are driving over the speed limit, not wearing your seatbelt, or you didn’t come to a full and complete stop, thank them for noticing and say that you will try and do better. Set the example on how to take correction because you will be giving plenty of your own when they are behind the wheel. “Do as I say, not as I do” is one saying that just won’t work with teenagers, especially with driving. Set a good example by modeling the behaviors listed above and your teen will not only follow you but they also just might listen to your corrections too. There has been a big push to educate the public on the danger of using cell phones while driving. The main reason a cell phone is dangerous is that it distracts drivers from the road. When it comes to teens driving, there is a bigger reason they aren’t paying attention to the road though and it is just as dangerous, if not more. A study published in the Journal of Adolescent Health in 2012 showed that the biggest distraction to a teen driver was peer passengers in the car. This information was found by comparing risks and factors documented on-scene by a crash investigator. When a teenager starts to drive, they are already at a disadvantage because of their lack of experience on the road. Driving independently is important for a teen to get experience on the road. In fact, the risk of getting into a crash drops by more than two-thirds after driving 1,000 to 1,500 miles. During this time, some states have extra laws that limit the number of passengers allowed in the vehicle. During the study, the male teens showed that they were much more likely to engage in risky behavior and maneuvers in front of their peers than if they were alone. A female teen driver with passengers didn’t have an increase in dangerous maneuvers, but they were more distracted because they were talking more with friends. Across the board, the teenagers were distracted by worrying more about what was going on inside their car than outside, taking their attention away from the road. States have implemented laws that help to decrease the risks of these behaviors. For example, Washington limits newly licensed drivers under the age of 18 for the first year. During the first six months, teen drivers are not allowed to have passengers under the age of 20 unless they are an immediate family member. 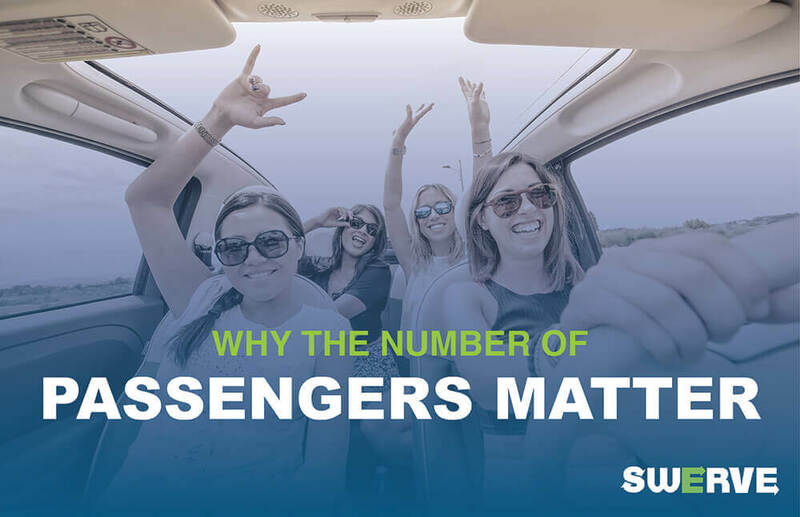 After those six months, the remaining six months of the year are limited to no more than three non-family passengers who are under 20 years old. All 50 states have adopted similar standards, referred to as graduated licensing laws. These grant privileges to new drivers in phases before receiving a regular driver’s license. The most successful laws combine these graduated licensing laws with limiting night driving and the number of passengers. These programs showed an 8 to 14 percent drop in fatal crashes for 16 to 17-year-olds. Having and enforcing these laws helps get teen drivers past those first crucial 1,000 to 1,500 miles. Once they are more experienced and feel comfortable behind the wheel, it hopefully isn’t such a big distraction to have friends in the car. Parents play a vital role in these laws and in limiting passengers. While you can’t always control your child or know if they are keeping the rules you set, you can still enforce what you do know. The risk of fatal crash triples when there are two or more peer passengers in the car with a teen driver and 59% of teen passenger deaths happen in cars driven by another teen. Make sure to talk to your teen driver about the laws and the expectations you have for them. If you live in a state where there are no laws limiting the number of passengers or their ages, make your own family rule about it. It can help keep your teen safe on the road. Many drivers on the road are only thinking about getting from point A to point B. It can be hard to stay safe on the roads when people aren’t paying good enough attention to their surroundings. Proactive drivers are always staying aware and thinking about safety. If you are interested in developing new habits for proactive driving, try these five things to change. Proactive drivers are thinking about safety from the moment they enter the vehicle. The first step to staying safe is using seat belts and making sure that all the passengers in their car are properly restrained too. Don’t ever start driving until everyone is ready to go. Other ways you can focus on safety include following traffic laws, driving within the speed limit, and maintaining a safe distance between cars. Drivers who are proactive aren’t aggressive. Aside from driving too fast, don’t cut in front of other drivers, never tailgate or get agitated, and never engage angry drivers with bad behavior. If another driver is harassing you and trying to harm you, call the police. These situations can endanger you and other drivers on the road. When you approach an intersection, it is important to anticipate what other drivers will do. If you arrived first and have the right-of-way and another driver starts entering the intersection, don’t just drive through anyway. Also, when your light turns green, look around before going through the intersection. It is a good idea to anticipate what other drivers are doing to avoid a collision. If there is any sort of confusion, try communicating with the other drivers by motioning for them to go, using a signal to show your intended movements, and using the proper turning lanes. Knowing that there are potential problems while traveling will help you drive proactively. Try not to drive the same speed as the cars in the lanes next to you. If you block the road for other drivers or find yourself in the middle lane surrounded by vehicles, you have nowhere to go if something goes wrong. Do your best to drive with an escape plan in mind, just in case you have a tire blow, a car by you loses control, or there is a collision, you have a way to stay safe. One of the biggest hazards drivers deal with on the road is driving distracted. It is important to stay focused on the road and everything that surrounds you. Watching for pedestrians, cars slowing or stopping in front of you, and other drivers changing lanes requires paying attention. Ignore your phone, keep passengers under control, and avoid messing with anything on your dashboard too much. To be proactive, you must stay focused. 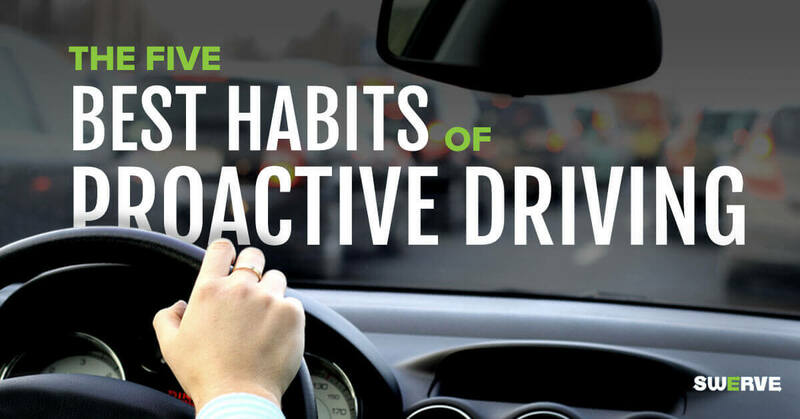 If you are looking to stay safe on the road, the best thing you can do is develop these proactive habits. Staying alert and driving defensively are the best ways you can get to your destination safely while keeping everyone around you safe too. Sixteen it a transformative age for many teenagers across the country because it means freedom. More freedom to do what they want, more responsibility, and a chance to be more like an adult. Not all teens are ready to drive on their sixteenth birthday though. States have tests that check for the readiness with knowing laws and how to handle a vehicle, but parents know their own child better than anyone else. 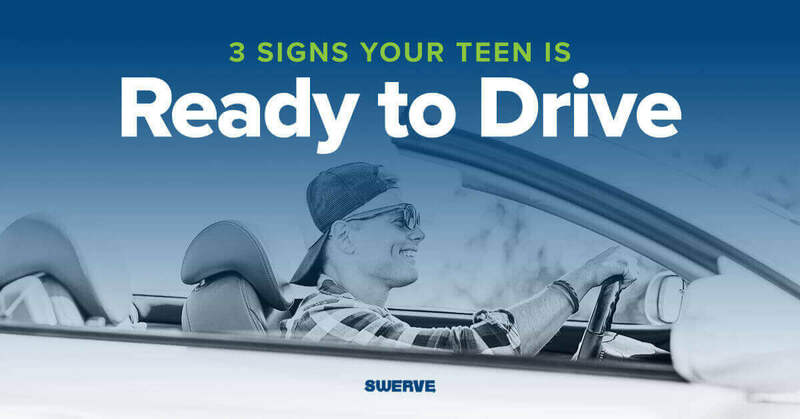 If you aren’t sure if your child is ready to drive or not, here are three signs that can help you decide. Making and keeping commitments is an important lesson to learn in life. As the parent, you should set expectations for your teenager to keep that are clear and fair. Getting a driver’s license is a serious step for a teenager because they are making a large commitment. Seeing how well they meet the expectations you set is a good indicator of how serious they are in getting a license and that they realize the responsibility that goes with it. While most teenagers do things that clearly weren’t very well thought through, there are still things they do that let you know they understand boundaries. Some of these boundaries are not participating in unsafe behaviors, acting appropriately in class, and keeping family rules. Teenagers are professional boundary pushers and won’t always act perfectly, but you can learn a lot by really paying attention. What boundaries they are pushing and why? If you can talk to them, it will give you a glimpse into their understanding of what is important. One part of brain development that happens during the teenage years is being able to foresee consequences. If a student does their homework and hands it in, they have a higher chance of learning the material and being successful in the classroom. However, if a student continually sleeps in late and doesn’t get to school on time, their chance of passing that morning class is very small. 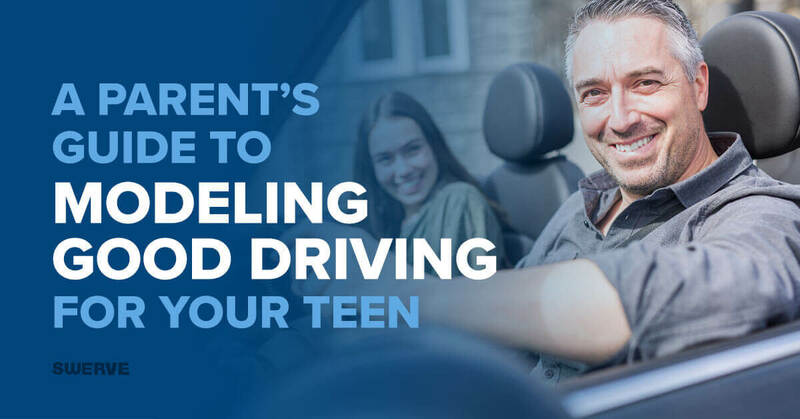 If your teenager is having a hard time understanding the concept of creating desired consequences, it might be more difficult for them to understand the seriousness of speeding, drinking and driving, and even texting while driving. If you don’t think your child is ready to drive, it’s important for you to talk to them about it. The government will never issue a driver’s license or permit to a minor without the consent of their parent. Make sure you are loving and kind while you explain the reasons why you think that and then help them see what steps they can take to become ready. Remember that no one is perfect and allow your teenager to change and try again. If you feel like your child is ready to drive, make sure you have a talk with them about your expectations. Check in with them often and always let them know you’re ready to answer any questions about driving that may come up. From grades to driving the speed limit, you help your teen succeed when you let them know you lovingly hold them to a high standard.